The Newron inline technology offers a perfect transition from hard surfaces to the ice rink. Now, players can substitute the expensive ice time for free concrete or asphalt surfaces around the world, and workouts are not limited by time constraints but rather the endurance of each player. Furthermore, parents don’t even have to take the child to a rink to get those extra hours of ice. Your driveway, street, basketball court or tennis court becomes a rink! 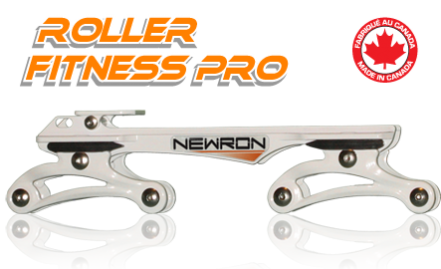 The Newron system is not to be confused with a standard inline skate; it is an “OFF-ICE” hockey skate, a perfect transition from ice to hard surfaces such as concrete. SPEED: 10% increase in speed. Friction is greatly absorbed by the blade system. AGILITY: Ability to skate more freely, just like an ice skate. You can now skate on roads, concrete, or any other hard surface, just like you would on ice. SECURITY: Reduces stress on muscles and joints, produced by ground impact. Surface imperfections are now absorbed by the Newron system. This scientifically reduce injuries.